Min £10 Deposit. Min odds: 4/5. Bonus bets valid for 7 days. T&C’s Apply. 18+. 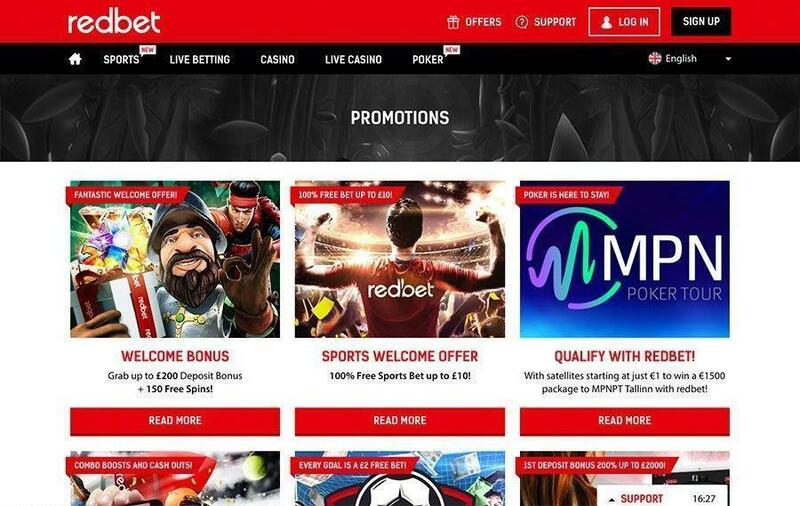 If you sign up with RedBet Sports it is of course a red letter day, but what makes it especially triumphant is the welcome bonus that all new players receive. This is an instant £10 bonus bet, no waiting, no wagering! To qualify for a bonus bet all you need to do is place a single, minimum £10 bet on any event with odds of 4/5 (1.80) or higher. You can use a combo bet as long as the total odds of the combo bet are at least 4/5. The amount wagered must be at least £10 – you cannot use two separate £5 singles, for example. Only singles and accas qualify, not system bets. Once your qualifying bet is settled, then you will receive a £10 bonus bet to use on any event of your choice. Note that if your free bet is a winning one, you will not receive back your free bet stake money, only the winnings. You can only have one bonus per account, IP address or household, and you must use your free bet within thirty days, else your bonus is forfeited. Note that this welcome bonus is not currently available for players who reside in the Sweden, Norway, Finland or Germany, or if you use Skrill, Neteller or Paysafecard to fund your initial £10 deposit. Special deals are always on offer at RedBet Sports. For example, the site runs a regular prize draw in which you must place a bet of at least €10 on a selected football match, and in addition guess the minute in which you think the first goal will be scored. If you are correct, then you will win at least a share of the €500 jackpot. If a goal is scored in the time you predicted but it is not the first goal, then you receive a consolation prize of €20. 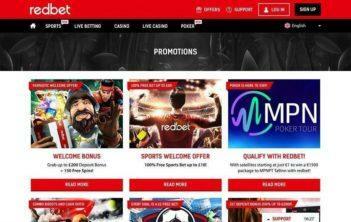 If you’re a fan of casino games as well as sports betting, then there are a number of bonuses you can take advantage of if you decide to play at the RedBet Casino, or the RedBet poker site. The casino bonus can see you earning as much as £200 in bonus funds, as well as one hundred and fifty free spins on online slots. There are two live sports sections available at the site: ‘SuperLive’ and Live Score. Cashout is also available on most markets. 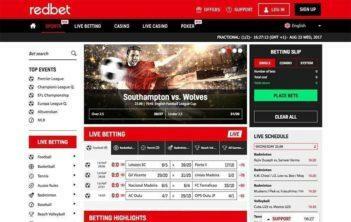 One thing used to strike you about the RedBet Sports site – the lack of sporting markets. The markets menu on the left-hand side of the screen was very sparsely populated, and to add a little volume to their offerings RedBet Sports unnecessarily split a couple of their sports into ‘men’ and ‘women’ categories – basketball and tennis. However, a 2017 upgrade saw plenty of sporting markets added to what was on offer, up to the standards of the very best sports book sites. The middle of the screen is divided into current events and forthcoming events, with the emphasis placed upon football. This section of the site has been very well designed but with a few oddities – for example, if you have the screen in ‘half screen’ mode the text ends up moving all over the place. The site’s makeover is a very welcome one and while a significant improvement, it’s still not quite all there. There are several ways you can fund your account at RedBet Sports: Visa or MasterCard credit or debit card, Paysafecard, Skrill, Trustly, iDeal, Zimpler or Neteller, plus a few other country-specific eWallets. The minimum accepted deposit is €10, and the maximum is €1,000. For your safety, you are encouraged to set your own deposit limits at the site, which is something that is always recommended. 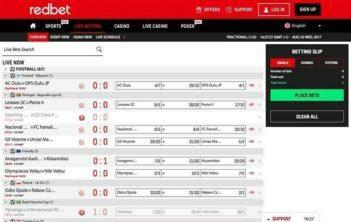 Make sure you check for currency exchange fees, as some methods at RedBet Sports do incur them. Deposits are processed instantly. You can withdraw to a credit card, Skrill, Neteller or via a direct bank transfer. The minimum allowable deposit is €20, and the maximum is €10,000. Withdrawal times are the standard 24-48 hours for eWallets, and three-to-five business days for credit cards. There’s a favourable free bet available at RedBet Sports, and thanks to a radical makeover there are plenty of sports betting markets available. 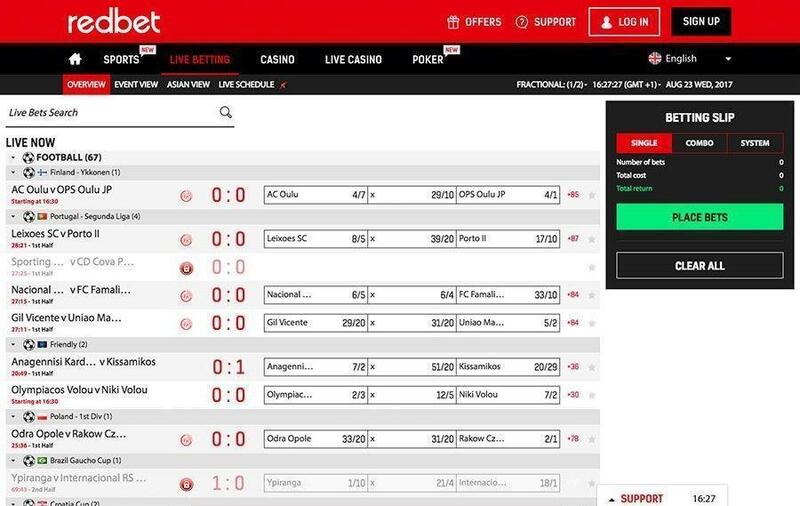 Redbet Sports has certainly gone up in our estimations, but there’s still a few strides to go before this site can be considered top of the tree.